Posted on Friday, September 17th, 2010. This case study looks at how Mobilize Mail is adding value to their clients through attracting more targeted prospects to their clients email marketing databases. BusinessBlogshub.com was created by Mobilize Mail to provide their clients with an effective marketing presence. The “old” way of attracting prospects is losing ground – advertisements, telemarketing, un-addressed mail, opt-out emails are all being ignored by consumers. This approach is called “Outbound Marketing”. Attracting prospects now requires transparency and dialogue. Businesses need to prove their worth and establish an open and transparent relationship with their customers and prospects. Businesses gain trust with two way communication and this approach is called “Inbound Marketing”. BusinessBlogs has been designed to fully utilise “Inbound Marketing” concepts. Essentially BusinessBlogs is a “blog hub”. Mobilize Mail clients can provide value to the 10,000+ monthly visitors to BusinessBlogs with informative content via articles, audio and video. The content can then be read by BusinessBlogs visitors (potential prospects) without the pressure of follow-up sales calls. Discussion between the readers and author is also encouraged – thus “inbound marketing” via two way communication. When content is published on BusinessBlogs – it’s social network profiles (facebook & twitter) are instantly alerted to the new content which helps drive more “eyeballs” to the articles. Email and RSS subscribers are also alerted. The image below shows the process of an author contributing articles to BusinessBlogs.co.nz and Mobilize Mail’s social media marketing solution (CampaignHub), automatically publishing and broadcasting the content the blog’s social networks. 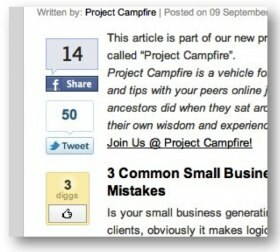 BusinessBlogs.co.nz provides “share” buttons on each post allowing the readers to share the content with their own networks which helps drive even more eyeballs to the article. If a reader is interested in further communication from the author of the post and is a Mobilize Mail client an email subscription form is provided at the bottom of every post authored by the client. The email subscription form allows the reader to instantly subscribe to the clients email newsletter without leaving the post! Providing BusinessBlogs blog to support the new “Inbound Marketing” concepts and build an extensive New Zealand focused readership to help increase brand awareness for the clients. Provided an instant email subscription form automatically embedded on all the clients articles. If you are interested in how Mobilize Mail can help increase your brand awareness online and attract more targeted prospects then contact Mobilize Mail here.